I really struggled with this one. At first, I was going to write one, then I wasn't. But something changed my mind. 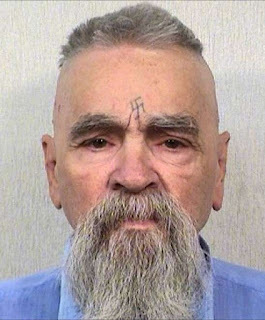 In the 60's Charles Manson led a cult of followers who he led to commit a series of nine murders. He was convicted of first-degree murder and conspiracy to commit murder for the deaths of seven people. This was the time of free love and peace. A generation of young people was rising up against the Vietnam War. Drugs such as acid and marijuana were becoming prevalent. A wave of humanism and atheism was sweeping across America. Then it all came to an end as the symbols of peace were found to be making war instead. Mason became a symbol of madness, violence and the ghastly. The nation looked at "hippies" as a blight. Their message of free love and peace fell on deaf ears. I know that the Bible says, "Do not judge." Believe me, I am not. But in all of my research, I cannot find anyone saying that Charles repented of his sins. An educated guess would be that upon leaving this life, he split hell wide open. This is the notion that changed my mind about writing this blog. After his death, I heard many people say, "Good, I hope he went to hell." The hate that Mason was able to conjured over 50 years ago has not died. Some of these people who said this were not even alive when it happened. Jesus died for Charles Manson There is no way around it. Christ's forgiveness would have been given if he had asked for it. God did not create Charles to be evil. He did not create him to commit murder. He did not create him to be the symbol of evil that he became. Charles made that choice. Today you have a choice. Every day you have a choice. But choices have a way of leading us down paths of life or death. What you focus on is what you choose. If you keep your sights set on evil, then evil you will find. If you keep your sights set on good, then you will find it. God is focusing on you right now. He wants you to trust Him with everything. God wants you to see what He sees. The hope, the potential, the life and the joy He has in store for you. Even in the midst of evil, God is still there. He will never leave you or ever give up on you. PRAY: Dear Jesus, help me to see the good in this world through your eyes today. AMEN.